Restriction enzyme EcoRI bound to DNA (magenta and green). Bacteria are under constant attack by bacteriophages, like the bacteriophage phiX174 described in an earlier Molecule of the Month. To protect themselves, many types of bacteria have developed a method to chop up any foreign DNA, such as that of an attacking phage. These bacteria build an endonuclease--an enzyme that cuts DNA--which is allowed to circulate in the bacterial cytoplasm, waiting for phage DNA. The endonucleases are termed "restriction enzymes" because they restrict the infection of bacteriophages. Each type of restriction enzyme seeks out a single DNA sequence and precisely cuts it in one place. For instance, the enzyme shown here, EcoRI (PDB entry 1eri ), cuts the sequence GAATTC, cutting between the G and the A. Of course, roving endonucleases can be dangerous, so bacteria protect their own DNA by modifying it with methyl groups. These groups are added to adenine or cytosine bases (depending on the particular type of bacteria) in the major groove. The methyl groups block the binding of restriction enzymes, but they do not block the normal reading and replication of the genomic information stored in the DNA. DNA from an attacking bacteriophage will not have these protective methyl groups and will be destroyed. Each particular type of bacteria has a restriction enzyme (or several different ones) that cuts a specific DNA sequence, paired with a methyl-transferase enzyme that protects this same sequence in the bacterial genome. A broken DNA helix with sticky ends. The booming field of biotechnology was made possible by the discovery of restriction enzymes in the early 1950's. With them, DNA may be cut in precise locations. A second enzyme--DNA ligase--may then be used to reassemble the pieces in any desired order. Together, these two enzymes allow researchers to assemble customized genomes. For instance, researchers can create designer bacteria that make insulin or growth hormone or add genes for disease resistance to agricultural plants. An interesting property of restriction enzymes simplifies this molecular cutting and pasting. Restriction enzymes typically recognize a symmetrical sequence of DNA, such as the site of EcoRI shown in the figure. Notice that the top strand is the same as the bottom strand, read backwards. When the enzyme cuts the strand between G and A, it leaves overhanging chains. 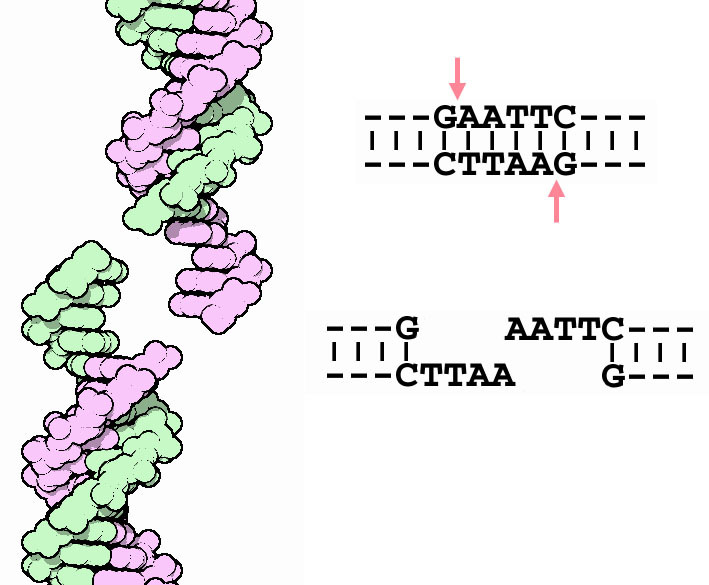 These are termed "sticky ends" because the base pairs formed between the two overhanging portions will glue the two pieces together, even though the backbone is cut. Sticky ends are an essential part of genetic engineering, allowing researchers to cut out little pieces of DNA and place them in specific places, where the sticky ends match. The PDB contains structures for many restriction enzymes. Another example from Escherichia coli--EcoRV--is shown here. The structure at the top, taken from PDB entry 1rva , shows the enzyme bound to a short piece of DNA. The arrow shows the phosphate group that will be cut. The lower illustration, taken from PDB entry 1rvc , shows the structure after the DNA has been cut. A water molecule has been inserted, so there are now two oxygen atoms, close to one another but not bonded together, where there was a single bonded oxygen atom in the intact DNA. In both illustrations, the protein is shown with a simple backbone representation and one DNA strand is colored green. These illustrations were created with RasMol. You can create similar illustrations by clicking on the PDB accession codes above and picking one of the options for 3D viewing.